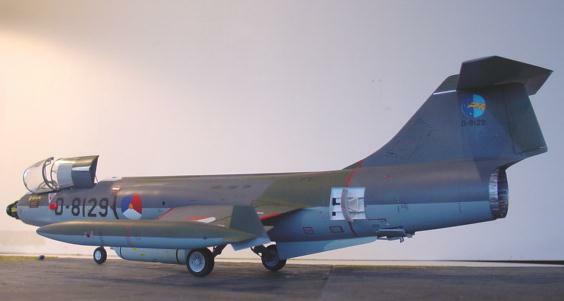 A special feature of the reconnaisance RF-104G was the special Dutch AF recon pod, called the Orpheus pod. I had no drawings at that time but some good pictures. The pod is 375 cm long, has a diameter of 47 cm and weighs 350 kg. So in 1/32 about 116 mm long with a circular cross section diameter of 15 mm. pod with special pylon, the gap still to be filled with white glue and to be painted. Aft of the center is an intake in the lower area, behind it is the internal cooler unit. The small pylon is tapered in shape. The various camera windows were suggested by cutting in clear tape with a scalpel the openings and applying the tape to the pod. The strips were of plastic to get the attachment points and the central cooling intake in the lower area opened. 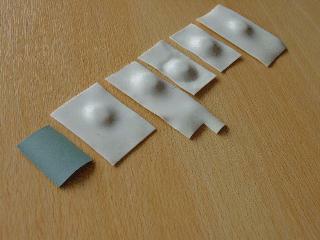 The pod was sprayed in the lighter grey. 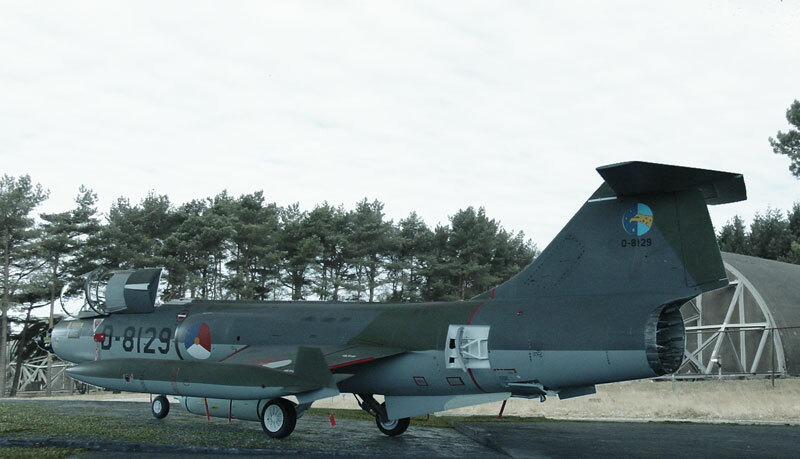 The F-104G Starfighter variants have thicker wheels and these are not in either kit. The G is capable of secondary bombing tasks to take -off with a higher weight. The main doors therefor also have the bulges in them. The wheels otherwise would not fit when retracted. NOTE: the newest later Hasegawa kit has "resin" parts for the wheels and doors. The canopy was made "detachable". 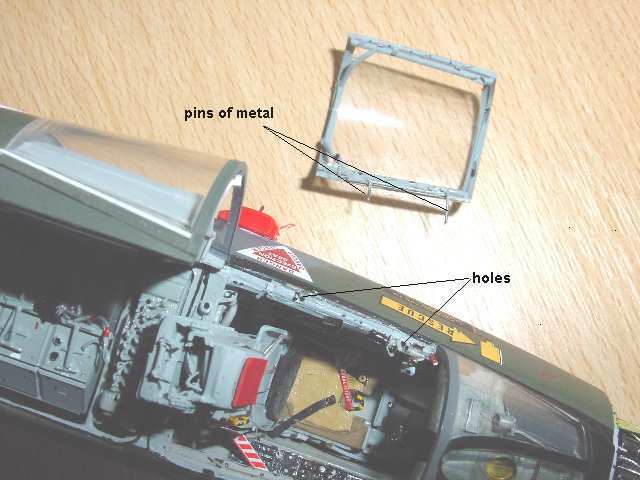 In the cockpit side two small holes were drilled, on the canopy two small metal pins (from paperclip) were made to fit. This way you can remove the canopy and make them thoroughly clean once in a while. The same was also done for the rear avionics hatch. I decided to add a circular piece of card, 2 mm thick between the wheel halves to get the thicker wheels. Also, the forward main undercarriage doors were made from thick card. 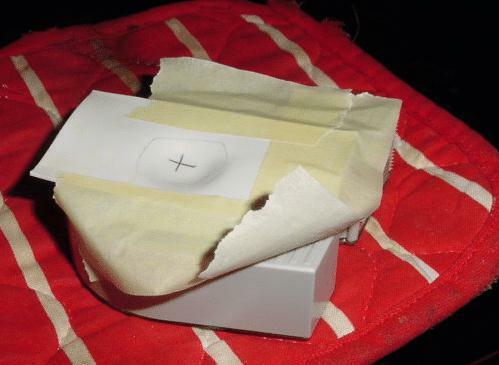 The card was disformed to get the bulge by heating the plastic in an oven and to press a shape into it. Be carefull with the heat, 5 minutes warming at 150 degrees Celsius should do it. Make some spare parts and use the best ones. The end result on the undercarriage can be seen here, note the bulge in the main door. I finally detailed the undercarriage with some painting and weathering with very much thinned dark paint. The Starfighters are all now being finished with final assembly of main parts such as the main doors and speed brakes. 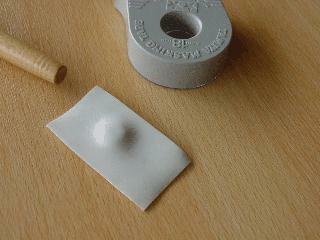 These were added as supplied in the Hasegawa kit. The speed brakes have retracting sliding attachments that go into the forward part of the brake bay. I opened these to get a much improved look. 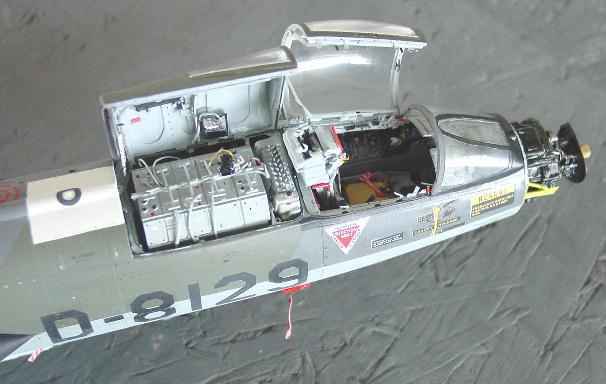 The fitting of the assembled tip tanks was a problem on the 1/32 Revell kit. The wing is too large in span! I had to remove 4 mm at each tip end! Although it was discovered very late by me and although I could correct it be carefully sawing off the tips, I strongly recommend of course to remove the end of the tips before assembly. 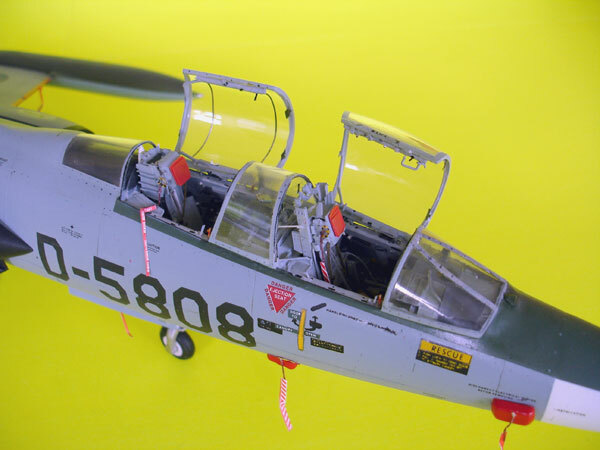 The Hasegawa tiptanks fit fine. 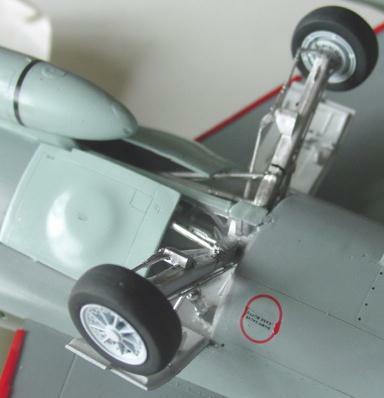 I only added fueldumps on the inner areas of the tanks just aft of the inner wing ailerons. Also the various decals were to be applied. 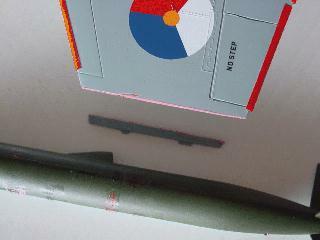 Many stencilling data should be added, the Starfighter was sometimes called the "flying instruction manual". Also, I checked the model panellines and grills. Very fine thinned paint (black and brown) was applied in the recessed panels but very lightly! F-104 aircraft are not like a tank but well maintained by its crews! 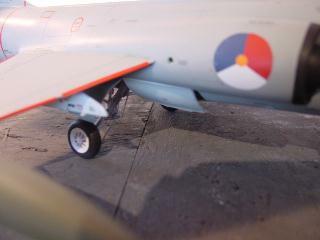 The very finely toched up areas were completed with added rivets in some areas by adding paint, slightly darker than the under base colour, with a tooth pick. The models now have to carefully cleaned up and given their final semi-matt varnish paint with the airbrush. The last step was fitting the transparant canopies. That completed the models. 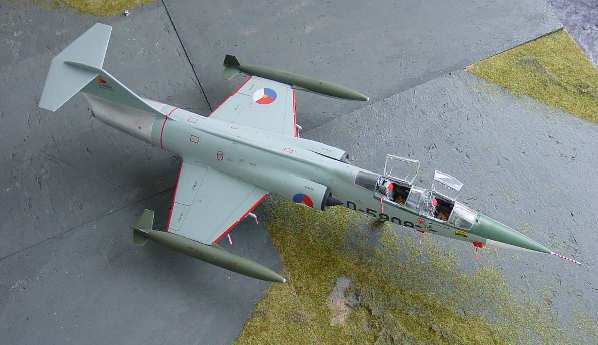 TF-104G Trainer of Dutch Masters conversion flight, code D-5808. Also flown as conversion section Volkel AB. 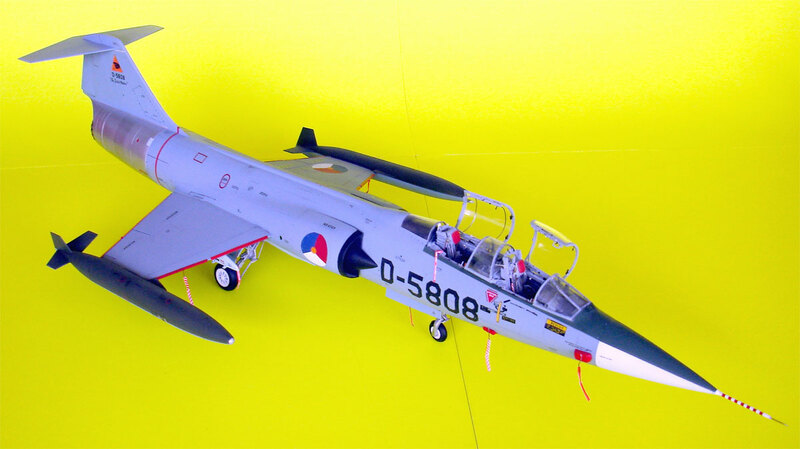 The TF-104G trainer version 1/32 model has been completed. The basis was the Revell kit. 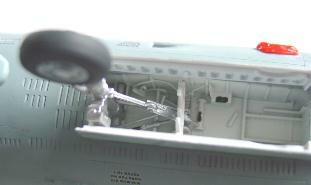 Also, two underwing pylons were added as supplied in the Revell 1/32 kit. Note also the bulged main doors and the protective red covers on the very sharp leading edges made. Decals are from Dutch decal set. Well, it took some effort but the result is worth it... a TF-104G Starfighter in the collection. 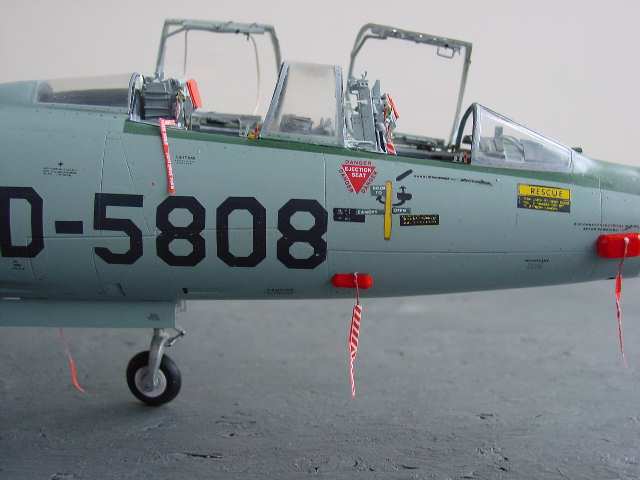 Tip and UPDATE: August 2018 a TF-104G was released by Italeri kit #2509 . 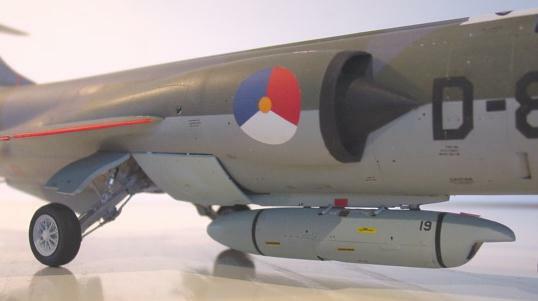 And here , the completed RF-104G model of the recon version Starfighter as used by the Royal Dutch Air Force. 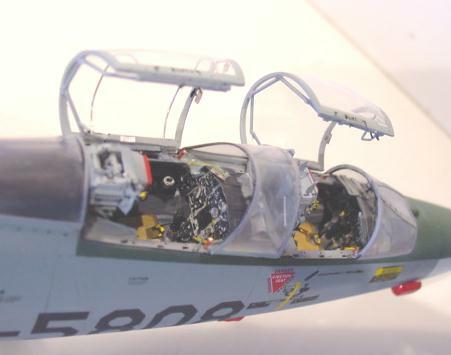 The RF-104G recon version with the opened avionics bay, Orpheus recon pod and the detailed cockpit and radar area. The nose cone will be kept separate. Well, that's it after a year... some nice models of the Starfighter in the collection was well worth it. 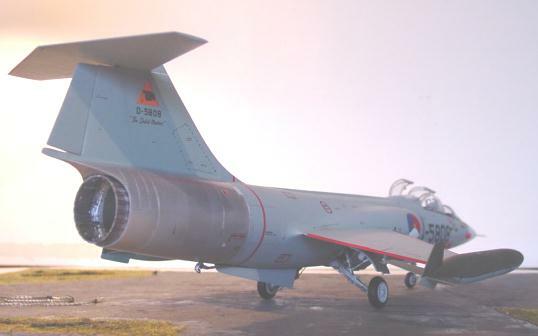 UPDATE I: Summer 2014 Italeri issued a very nice 1/32 scale F-104 kit #2502 with various options and including KLu F-104G details and decals. 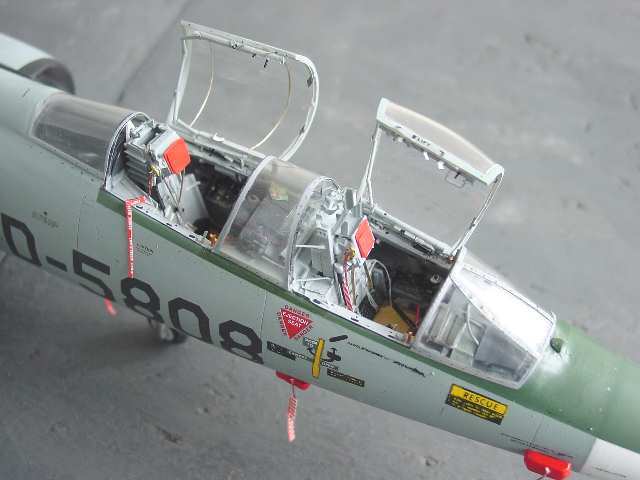 UPDATE II: May 2018 this kit was also released as RF-104G with an additional sprue, kit #2514. And August 2018 a TF-104G was released kit #2509 . 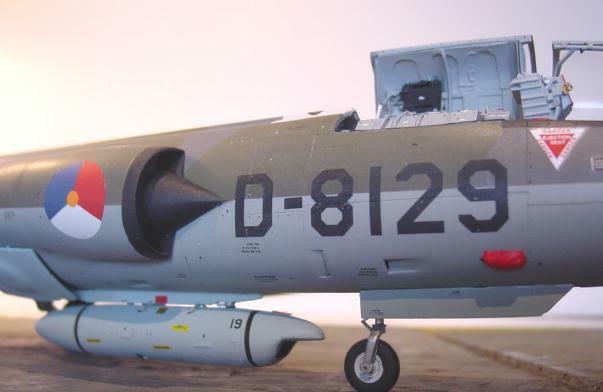 In 2018 the Italian company Videoaviation.com has released a 1/32 Orpheus reconnaissance pod from the company Oude Delft in two versions: a KLu version and an Italian version. 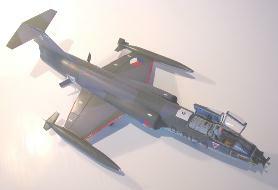 (The Italian version is in the recent 1/32 Italeri RF-104G kit #2514 but not the KLu Orpheus pod version). The Orpheus pod was developed for the Royal Netherlands Air Force in the 1970s by Fokker-VFW for the pod and Dutch company Oude Delft for the optics. 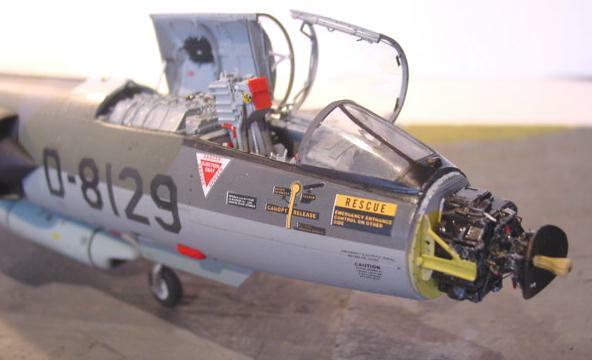 It was used on the RF-104G. The overall system was the Orpheus pod itself and a mobile Fokker processing unit in a trailer. The made films after the recon flight could be quickly developed when the aircraft had returned to base. The films were developed in an automated KODAK system and than interpreted by specialists. Their conclusions were telephoned to the battle commanders. 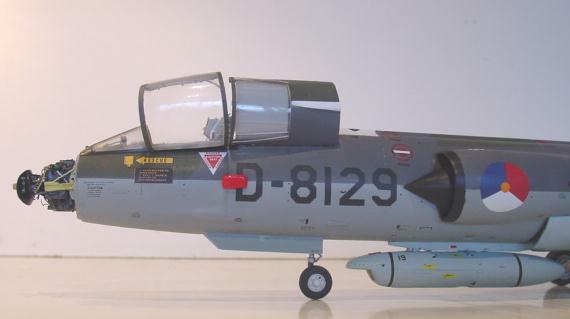 I was curious about the resin KLu Orpheus pod (kit #186832) as used on the RF-104 Starfighter of KLu no. 306 squadron and later the F-16. An order was made directly at the website www.videoaviation.com/ Delivery was within a week. The set for the Orpheus pod has 2 large parts, some small bits and a good decal sheet. The resin parts are fine without any disturbing air bubbles. After the two large parts were put together with super glue the total length was indeed correct to scale. On some pods a sort of handle is situated at the front but not always. (At the lower rear also a very small drain is missing, I found out only later). The KLu pod is usually "light gray" RAL 7001 (though FS 36440 is also suggested). I used Gunze Sangyo H324 as approximation. On the real KLu Orpheus pod the camera side blinds (sliding covers) are closed on the ground to protect the glass windows and open prior to photographing. The blinds can only slided aft to expose the windows when the undercarriage was retracted, so in flight. The forward nose camera does not have a blind, so you will see a darker glass window. This can be suggested with a black area/decal covered with Tamiya Smoke X-19 transparent. The decals are fine, the only thing missing is the visible pod number, for which a few decals were quickly found in the spare box (here no "18") . 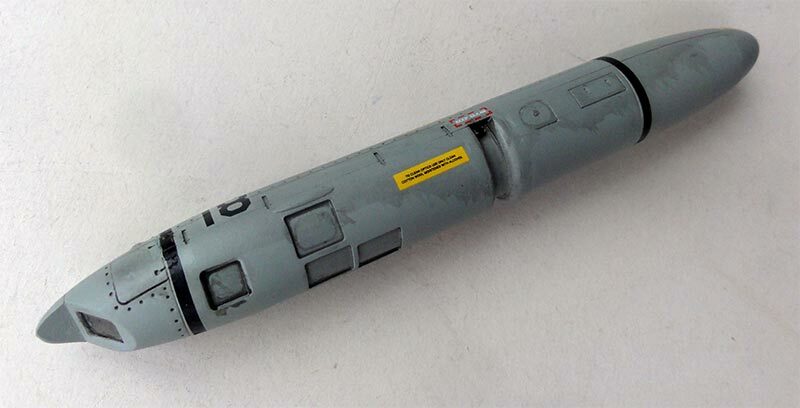 The 1/32 pod looks very neat and can be installed under a RF-104 or F-16. (as compared to my scratch build one 200% better! ).